Address: 6900, Makó Megyeház utca 4. The new permanent exhibition at the Attila József Museum of Makó managed by the Csongrád County self-government Opened on 26 June, after six-month's work. The showing fulfilling requirements of the 21st century presents the history of the town of Makó after the resettling of 1699 after expulsion of the Turkish to the change of regime in 1989. Supported by the ALFA program announced by the Ministry of Education, the exhibition presents historic documents, maps, photos, statues, paintings, individual objects followed by a genre painting of a fair from the beginning of the 20th century. Mannequins dressed in period cloths, chief vendor, newsagent, hone cake vendor, peasant man selling onion await the visitors. Three interiors are presented in the next section: a clean room from Apátfalva, a noble salon from the 19th century and a bourgeois dining room from the 1930-40's. People living in Apátfalva, the village near Makó, preserved their traditions, clothing, typical fittings etc until WWII. With painted furniture, white embroidery with pillows, made beds holy pictures, mirrors, beehive oven the clean room is a real curiosity. Fitting of the significant Návay family in Csanád County are on display in the Noble Salon. From 1849 to 1855, Mihály Návay harboured János Damjanich and György Láhner in his house in Makó. 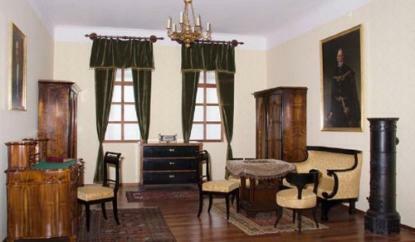 The armchairs owned by János Damjanich were preserved and bestowed to the museum by the Návay family. Portraits of the lord lieutenant at the War of Independence of 1848-49, Tamás Návay, and Lajos Návay, who was the martyr of the fights in 1919. The fitting of the bourgeois dining room once stood in the home of János Espersit. The home of the well-known maverick, patron was full of pictures by painter friends from the Great Planes. The atmosphere of WWII are conjured up by songs sang by Katalin Karády played by the old gramophone. The exhibition also includes the nicest pictures borrowed by the Csanád and Tornotál Museums: Mary Teresa, Queen Elizabeth, István Széchenyi, Ferenc Deák, Lajos Kossuth. The artist are Miklós Barabás, Bertalan Székely, Bertalan Karlovszky. The new permanent exhibition rooms have air conditioning and computers help the visitors in orientation.